The winds were dwindling in the forecast. 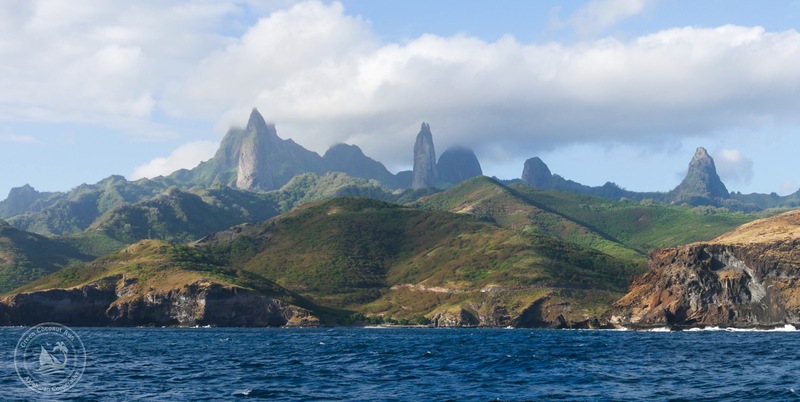 We were enjoying our visit to Reao Atoll immensely, but if we were to sail the remaining 450 nautical miles to Marquesas, we had to make a move. After touring us around all day, Marguerite then made a wonderful meal, also inviting the driver and his two companions. Watching the play of light over the lagoon in front of their patio, we felt an overwhelming gratitude at being treated as “insta-family” on this atoll. To add to boot, the driver and his friends prepared two boxes of coconuts and kava (like lychee) for us to take on the journey. What a gift! Our visit had been too brief – with heavy hearts we bid farewells to our new friends. The goodbyes lingered; and suddenly dusk was upon us. Darkness was descending, and the whole village seemed to rally to ensure our safe departure. Due to lack of visibility, the skiff captain took us back to Aldebaran in two trips. The maneuver was hair-raising; shining a spotlight ahead, he timed the sets of waves and expertly navigated the tiny reef keyhole to reach the deeper water. Meanwhile, two dozen people milled about the wharf, illuminated by moonlight, taking last minute photos with the rare visitors. 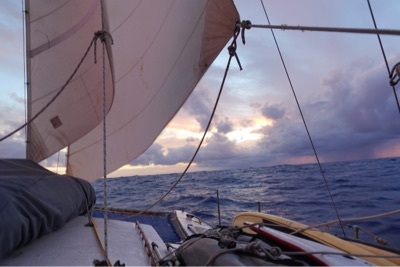 We set sail at 8pm going north with 12 knots of wind from the east. Behind us, Reao’s lights looked small in the vast black horizon. 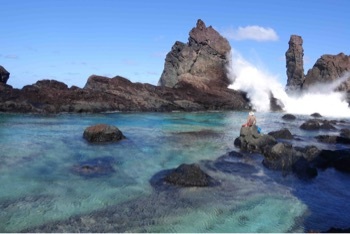 It reminded me of our departure from another tiny place: Pitcairn Island. I felt that same terrible bitter sweetness. Goodbye, my friends, living in an isolated dot of ocean. Here in Reao, more than anywhere, we felt extremely appreciated for simply coming to visit. In the “normal” world, it is rare to feel such deep gratitude for our mere presence and companionship – with no expectation of length of time, or exchange. 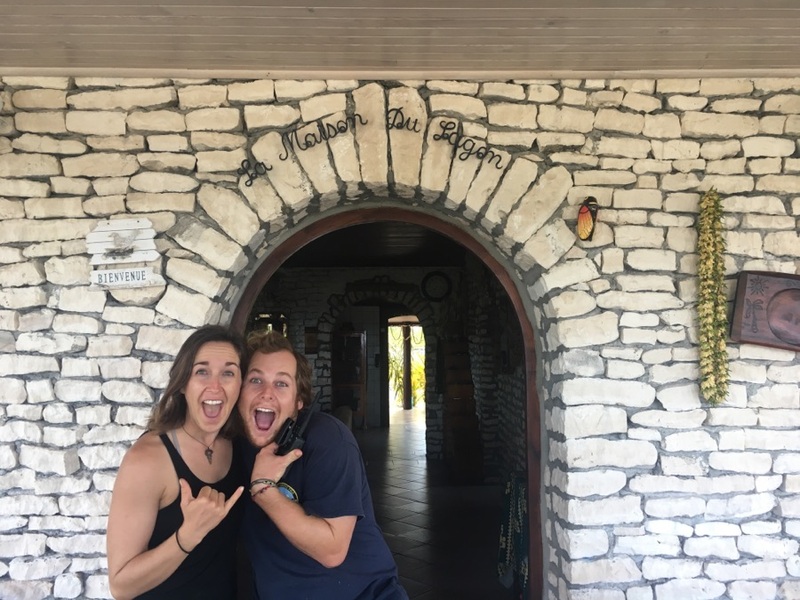 Besides the many surprises in this atoll – the sunken seaplane, harvesting clams (and octopus), the stages of copra, and the fabulous water – what we learned most from Reao was gratitude. There is no greater gift than deeply appreciating each other’s company, moment-by-moment. Photo: Walking the placid lagoon in Reao… as they say in Tahitian, ‘Maururu’! Thank you! 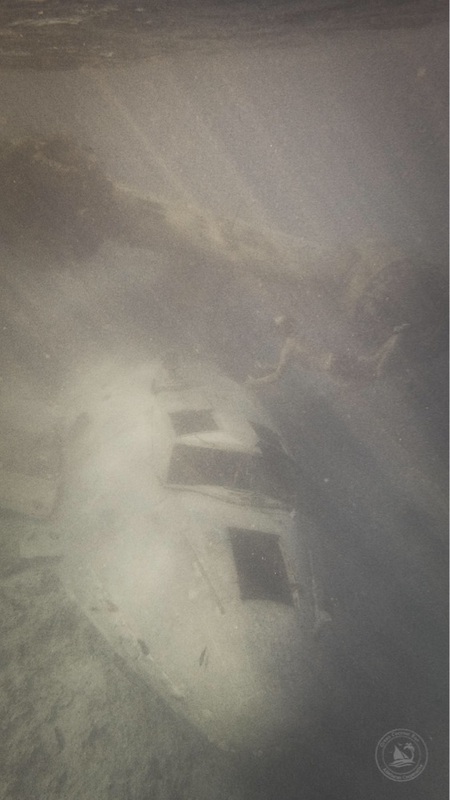 It’s not every day that we come across an underwater plane wreck… much less one that we can snorkel around without any SCUBA. 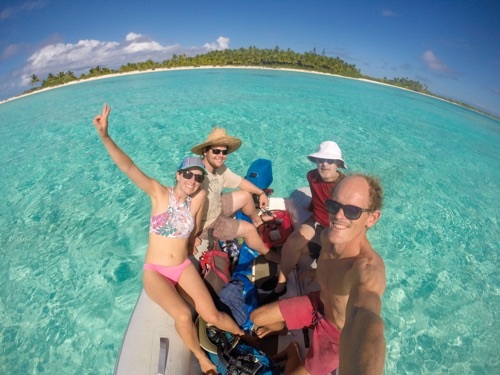 A truly unique experience in this remote Tuamotos atoll! Photo: Captain K swims down to check out the plane’s cockpit. The plane has been in this watery grave in Reao Atoll since 1995. Photo by Spencer. By Spencer. We snorkeled out to the shallow crash site just a hundred yards from shore and began exploring. Beadle and I had weights and were able to dive down and under the wings without SCUBA (A rarity for wrecks) and I even did a swim thru the fuselage! The sediment in the water gave the wreck that eerie feeling that all wrecks have; however, as the sun shone through the clouds, the colors of the algae came to life. The engines were hairy with feathers of barnacles protruding from all over. Large clams had fixed themselves to the wreck, their lips shimmering beautiful greens, yellows, and blues. 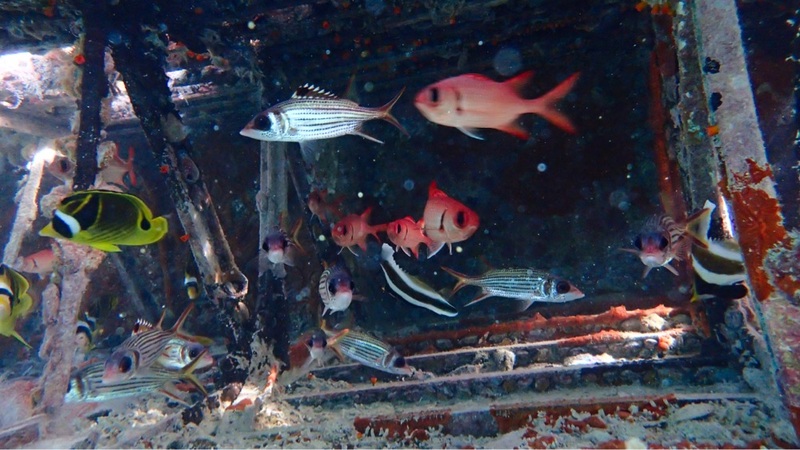 One surprise: we dove down and peaked inside the wings, suddenly discovering hundreds of colorful tropical fish, which contrasted sharply with the grey metal carcass of their home (see photo at bottom). Inside the plane’s cockpit, springs jutted out from the frames of seats long decomposed. 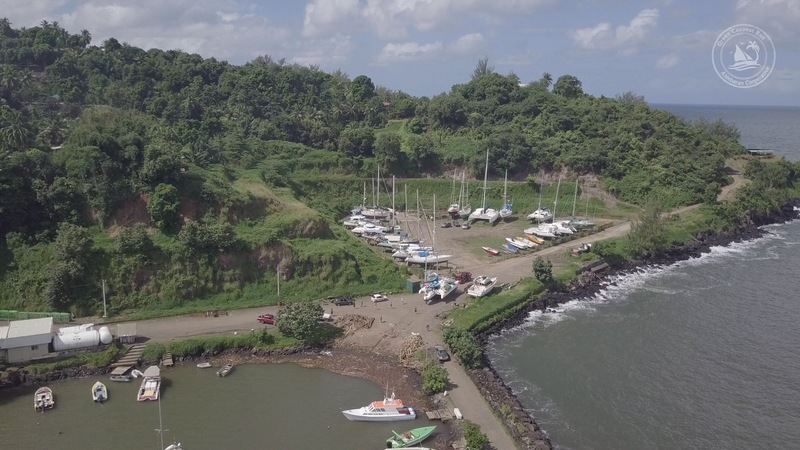 The port wing was the deepest of the wreck sitting in about 25’ of water; and under it large stripped yellow fish chased small red, white and blue fish back and forth. They occasionally misjudged their speed and hit the silty bottom causing a plume of dust to rise from the impact. The placid nature of the lagoon has preserved the wreck very well and we were ecstatic when we swam back to shore. Capitan even jumped in the air squealing with delight when we got back to the truck. 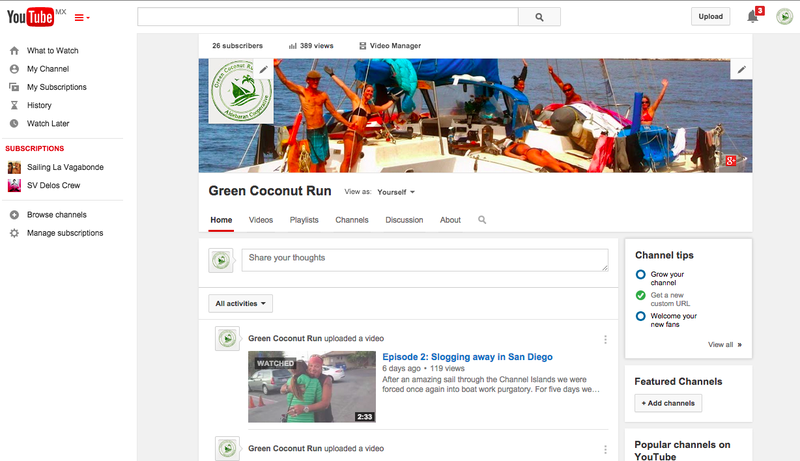 This was a superb and unusual way to break up the passage to Fatu Hiva. 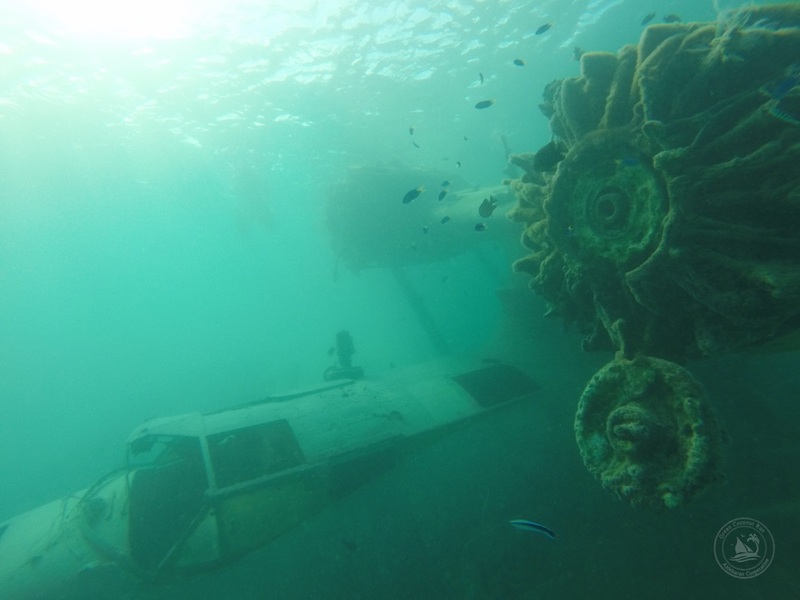 A plunge into the lagoon’s cerulean waters revealed a wonderland of clams, sea cucumbers, and a plethora of fish who have made a home in the wreckage of an aircraft now resting on the bottom. This was the wreck of the Catalina, a sea plane that in times past was an atoll hopper bringing provisions, mail and people to and fro the remote atolls of the area. In 1995 the Catalina landed as it had many times before; however, a chop in the sea and a gust in the wind that fateful day dipped the wing into the lagoon where the water was waiting to greet it for all eternity. The watery grave the plane sits in is on the edge of a shelf where the depth is only 5 meters and the broken starboard wing of the craft sticks above the water like a headstone. Ever wonder where your coconut oil comes from? It might originate at the hands of Jean-Francois, a bulky man from Reao with a cleft lip. 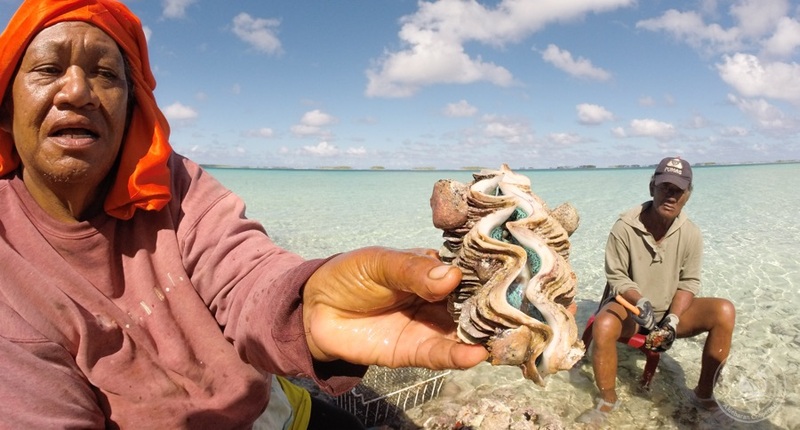 He is one of thousands of small landowners with coconut trees throughout the South Pacific who sell copra. 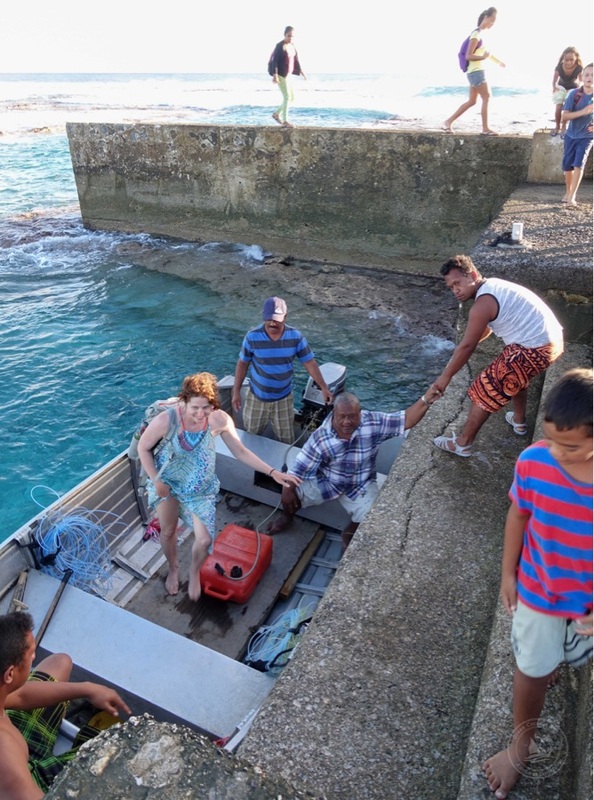 Our welcome party in Reao took us in a car to the other breakwater. A tractor towing an aluminum boat followed us through the streets, along with a growing entourage. 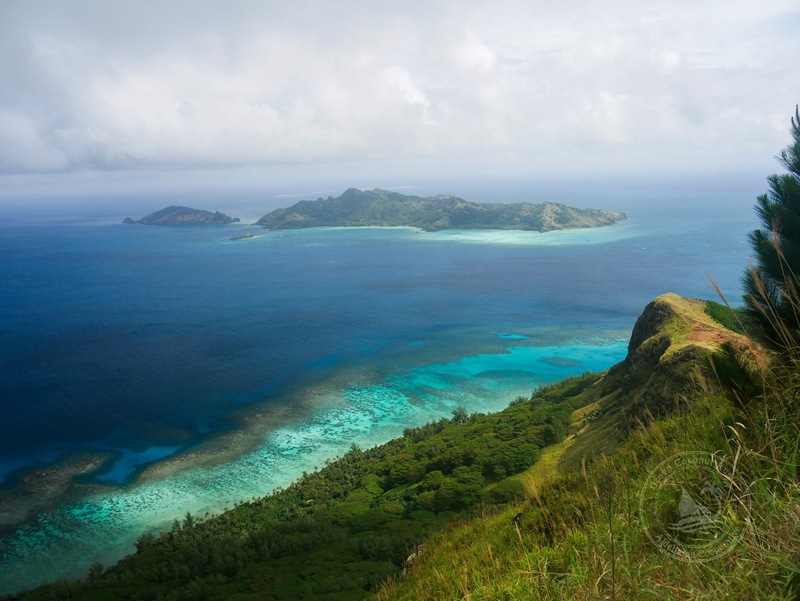 Reao doesn’t receive many visitors due to their remoteness and poor anchorage. They told us we are the first sailboat to arrive this year. The excitement on shore was palpable. More people showed up at the Southern Breakwater to introduce themselves to us; it felt like we were meeting the entire town. Their aluminum skiff was lowered into the water then zoomed out towards Aldebaran, through a “keyhole” in the reef. The keyhole looked like a channel from our vantage point, but waves also broke across it every few minutes. After returning from Aldebaran, the skipper timed the sets and expertly maneuvered through the narrow 20 foot channel. It returned with only Deena in tow. “Were you able to anchor?” I radioed to Kristian. By now the sun was starting to set. After many hearty introductions – and some discussion about whether Pierre gave us “permission” to stay on the island, we were then encouraged to go… walk. Ahhh… walk where? I was also unclear what ‘staying on the island’ meant. Was this permission to walk around? Or permission to stay with someone? Keeping in mind the setting sun, and the potentially long paddle back to Aldebaran, we went walking. A growing group of kids followed paces behind us. I tried to ask our entourage where we should go, but they were bashful and shrugged their shoulders as if they didn’t know. “What about your lagoon? Can we go visit that?” They nodded yes and pointed to a road ahead. “They put us in the back of a pickup truck. I have no idea what’s happening or where they are taking us. Maybe someone’s house for dinner. Do you copy?” I said over the portable VHF radio, awaiting Kristian’s response. He had stayed on the boat, at anchor just off Reao atoll. 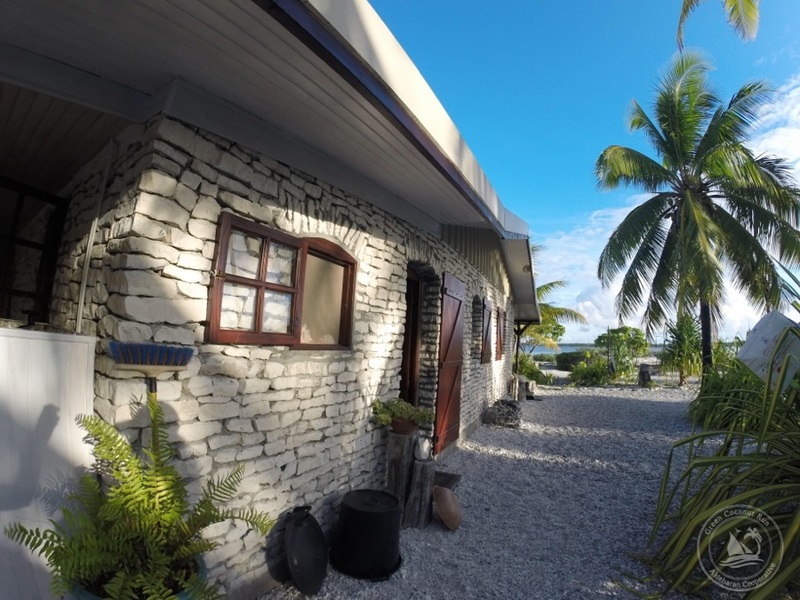 We had arrived in the 12 mile long atoll of Reao at 3:30pm. Like all the other atolls in Tuamotos, Reao is an oblong shaped ring of land which surrounds a large lagoon. Without a pass into the lagoon, nor any good anchorages, we were at a loss of what to do. Everywhere around the island plummeted to great depths of 300 to 500 ft, which is impossible to anchor. With the binoculars, we could see people gathering by the breakwater, surrounded by small breaking waves over dry reef. With the boat adrift in neutral, Spencer and I shoved our essentials in a dry bag (radio, wallet, water, and long sleeve in case of bugs), lowered the Stand Up Paddle boards into the water, and paddled ourselves in. The clock was ticking as we only had a couple hours before dark to determine if we could safely anchor and visit. The surge on shore was strong, and we nearly got swept off the cement steps that climbed up the side of the breakwater. 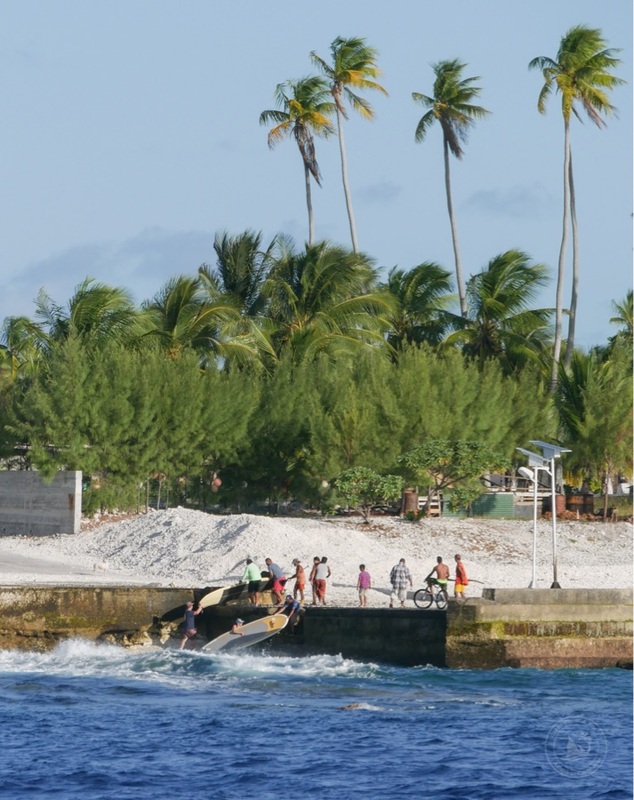 The helpful locals assisted us by grabbing our boards and raising them to their makeshift cement wharf. The crowd bustled around us. The chief introduced himself first. His name was so long, I was at a loss to even try and attempt to repeat it! He then said in French, “You can call me Pierre.” (Perfect, that’s my brother’s name!). The chief was a short, stout man, who stood about four and a half feet tall and carried a stoic expression. “Welcome to Reao” he said, eyeing us with his head crooked. “How many days do you want to stay here?” His expression was stern with his eyes half open. Pierre directed me to another breakwater with a launch ramp for small boats, near where ships typically anchor. I radioed the information to Kristian. The Tuamoto atolls are very bizarre. From the air, they are simply a ring of sand and coconut trees around a huge lagoon. There are more than 30 such atolls. They are formed by old volcanos which sunk under their own weight, after geological uplifting was over. During that process, the coral reef developed around the crater. 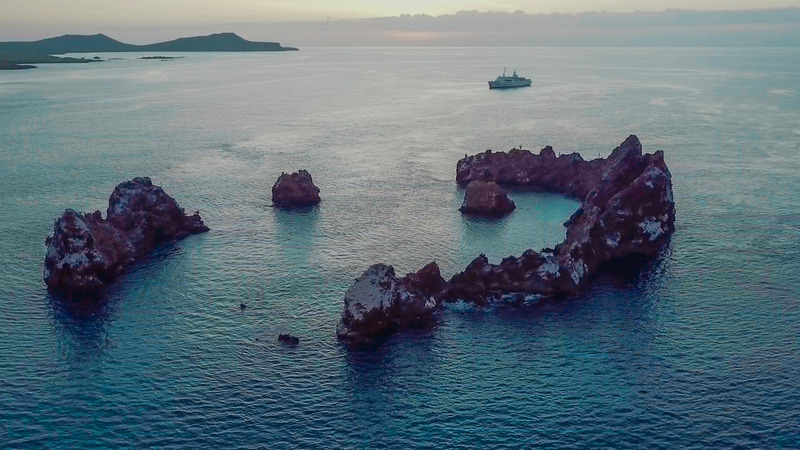 Normally, the volcanic island would simply sink into the ocean (as many old craters are sinking in Galapagos). What prevents this total disappearance is the prolific coral reef that keeps growing and feeding land into the island. Since it is purely coral substrate, there is no sediment (ie mud), hence the water is extraordinarily clear. Reao’s lagoon is some 9 miles long, but there is no pass that allows boats to enter inside the lagoon. From the satellite imagery, we could see the village on the north-west corner of the atoll, with what looks to be a dinghy landing. 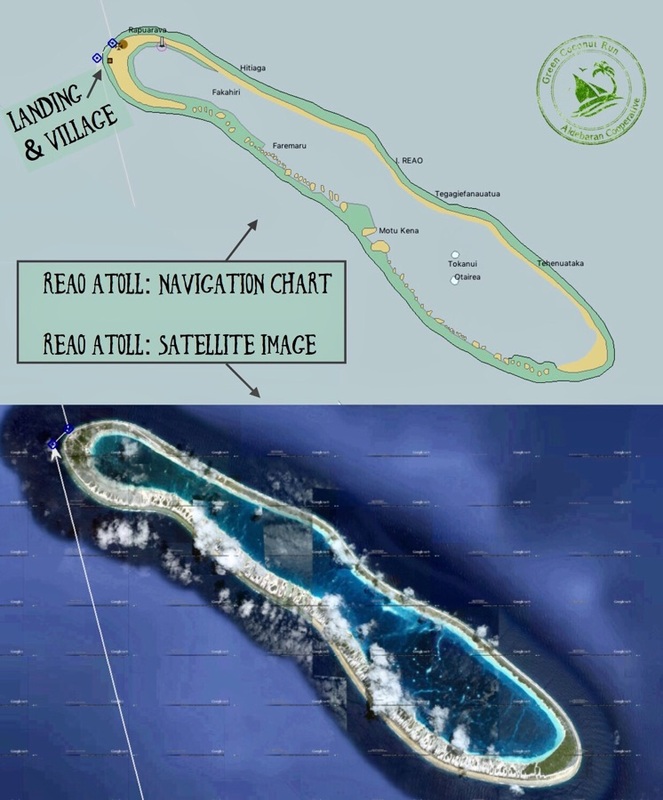 That is what we were aiming for, as we had zero other information about this atoll.